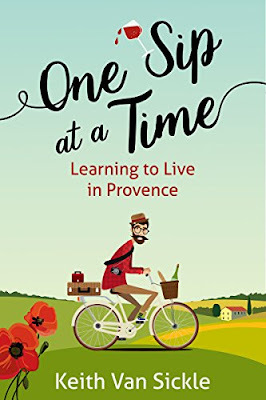 My review today is for One Sip at a Time: Learning to Live in Provence, a memoir of time spent in France, by Keith Van Sickle. This book (with it’s gorgeous cover) is well titled, as it is more a collection of events and situations rather than a typical memoir. Each one is no more than a sip, perfectly rounded on the palette in terms of flavour and description, but not quite as thirst quenching as taking a satisfying gulp. There were times I wanted more. Keith and Val have a dream to live in Provence, and unlike many, they come up with a plan to make that dream come true, even if it’s only on a part-time basis. By becoming consultants they are able to split their time between France and Silicon Valley in the States and from the start throw themselves into French village life, even if they knew they would only be staying for three months. This is to be highly commended and I’m sure gave them a much richer and better experience. They actively sought out real French people to talk to and learn from. They enjoyed sampling the food and drink available locally. They read French newspapers daily and immersed themselves in French culture and politics wherever possible – chapeau to them! 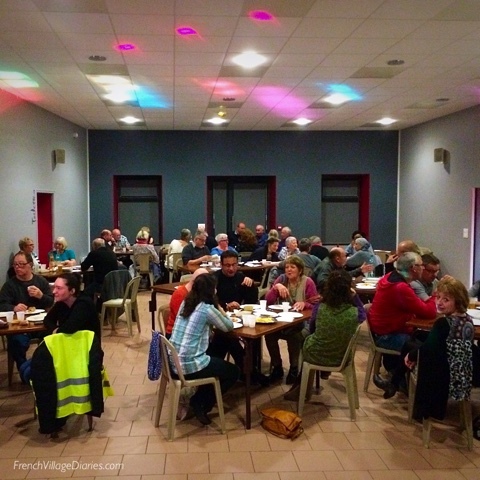 In a humorous way Keith highlights the (many) differences between the life they have left behind and the life they now find themselves living and yes, even for a Brit the French way can be difficult to understand at first. Reading this book made me realise I must have been in France too long as I found myself raising an eyebrow in disbelief at some of his observations. 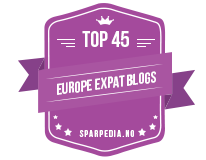 For example, in my experience if you avoid the hot spots of Paris and Provence, while not every driver is careful (where in the world are they?) there is far less madness on the roads than the author would have you believe. This book highlights what is possible when you work hard at making your dreams come true and is available in ebook format and in paperback, links to Amazon can be found below. You can follow Keith on his website here, and on Twitter too. 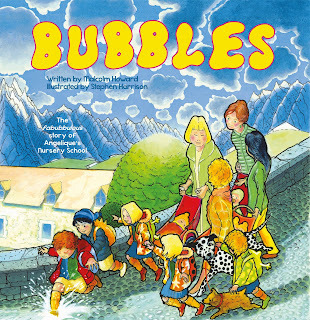 Today I am reviewing something a little bit different, but packed full of fun; Bubbles, a children's book set in a small school in a mountain village. This book, as all good children’s books should be, is great fun and engaging. Even at 45 I enjoyed reading about the small village school in the mountains with new teacher Angelique and her mysterious magical bubbles. Angelique is a schoolteacher with a difference and there are also some rather strange classmates, but by the end of the week everyone has made a special friend and I’m sure I’m not the only reader who would have loved to have joined in with their special play times too. Within the pages there are bucketfuls of imagination, adventures, vivid illustrations (so important in a children’s book) and superb descriptions. I would have loved to have read this to Ed at bedtime when he was younger and I’m sure little readers will enjoy it as much as I did. I can’t help feeling the love for the small French village that has become our home over the last twelve years. We may only have around four hundred residents and be in a very quiet and rural area, but that doesn’t mean we are stuck in a forgotten backwater where nothing happens. We have life and soul and we are proud of it. Last Wednesday when I was playing at being librarian for an afternoon, chatting to old and new residents about village life, it struck me just how much does go on, even at this time of year. 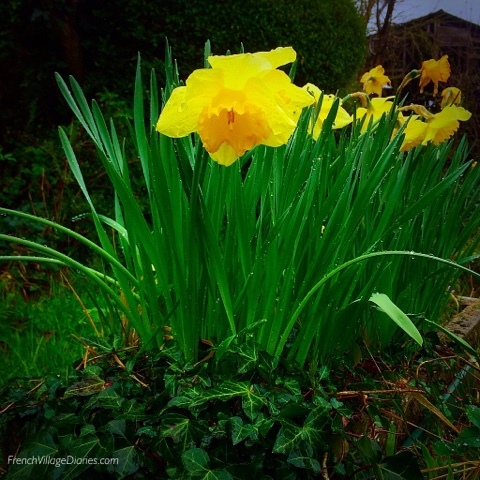 I decided a photo diary for the week would be the perfect way to document village life. So, here it is. The library is open every Wednesday afternoon. Some pop in for a chat, some with laptops to connect to the wifi and some to choose books. 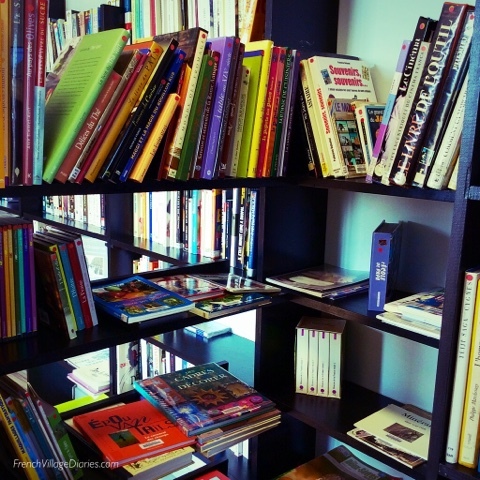 We have a good selection of books for young and older readers, including large print and books in English. Everyone is welcome. 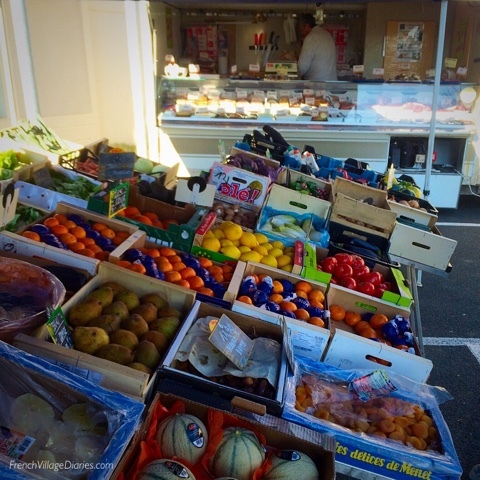 Thursday is market day thanks to the initiative of the fruit and veg man who asked if he could set up in the car park every Thursday morning. He now also has a chilled cabinet with cheese, yoghurt and other dairy products and has been joined by a butcher selling fresh meat and charcuterie, as well as prepared dishes like quiche and salads. 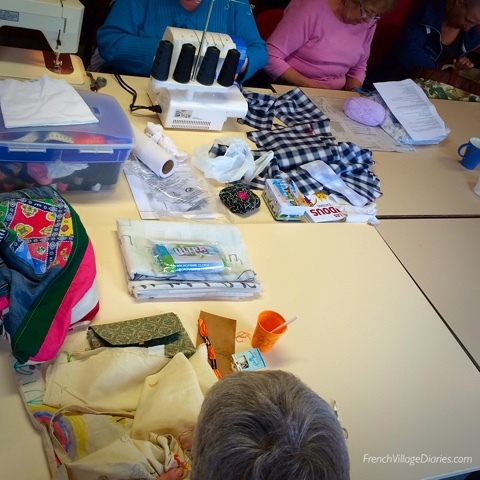 Friday morning is our sewing club that has grown from three to almost twenty members in a year. Some sew, some knit, some crochet and some sketch, but all of us enjoy a fun morning of tea, coffee, cake, chatter and laughter together. 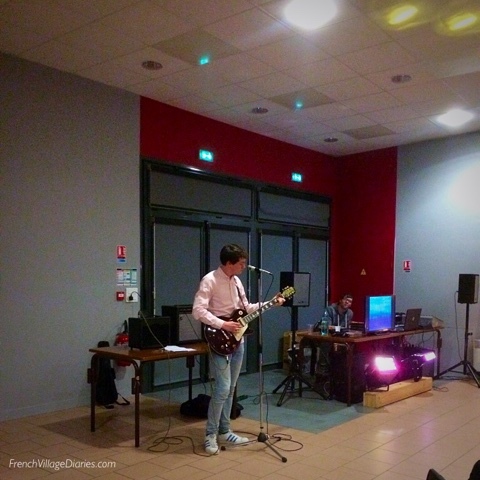 Last Saturday saw the Salle des Fêtes open it’s doors for an informal night of food, music and fun. There was a disco, live music and snacks delivered to the tables, followed by karaoke that literally brought tears to many eyes. Sunday is always my day to indulge at the village boulangerie where the daily bread selection is joined by a choice of fresh patisseries. This week Ed and I shared a delicious Capitole Poire and a Fôret Noire. Monday has recently become keep-fit night, which is perfect following an over-indulgent Sunday. 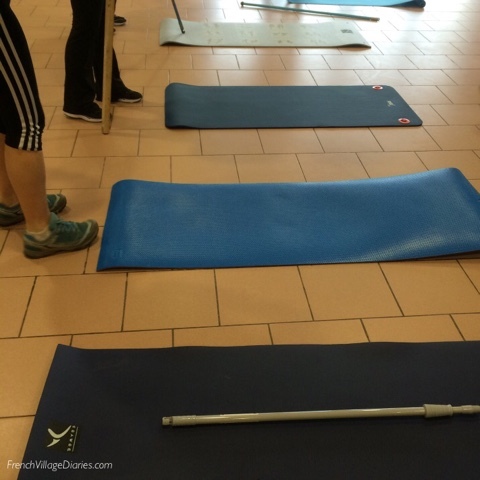 With nothing more than an exercise mat, a broom handle and a weighty bottle of water, Jean-Marc puts us through our paces with exercises to tone our legs, arms and abs. He even manages to make us laugh along the way. Tuesday is a quiet day. The boulangerie is closed, there are no regular activities and today even the weather is chilly and damp, making me want to hide away indoors. I need your ideas please. If you lived here, what would you like to do on Tuesdays? You may think I’m lucky to live somewhere that is small and rural, but also has lots going on, but I know it takes more than luck to find yourself somewhere this special. It takes people who are prepared to open their front doors, meet their neighbours and put in the time and effort required to set up and run the associations who organise these events. It also takes a community prepared to come out and attend the events to ensure they don’t fade away. 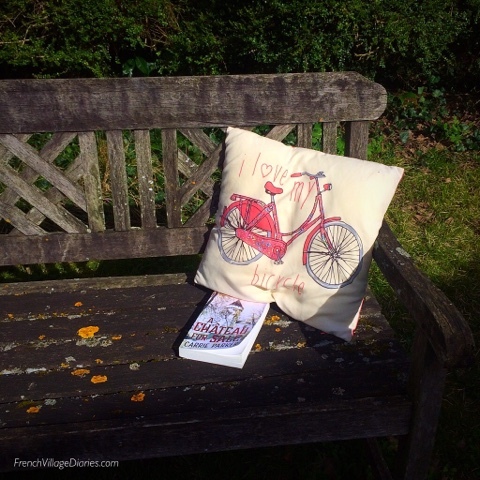 I hope you have enjoyed a little peek into my French village life. Yesterday afternoon I was the taxi that had to take Ed into Melle to meet up with his mates. We were early and although I’m not too clingy a Mum (!) I don’t like to leave him until at least one of his friends has also turned up. While waiting, I thought I’d pop out of the car and take a peek at the little book hut that has recently appeared in the car park. 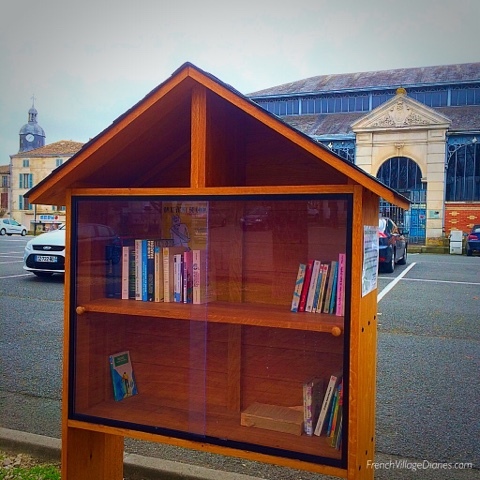 These mini sharing libraries, where anyone is free to take or leave books, are becoming popular in our area at the moment. I wasn’t really thinking about the books though, more an arty shot with the clock tower and market halle for Instagram. However, I got more than that as a book caught my eye; no real surprise there. 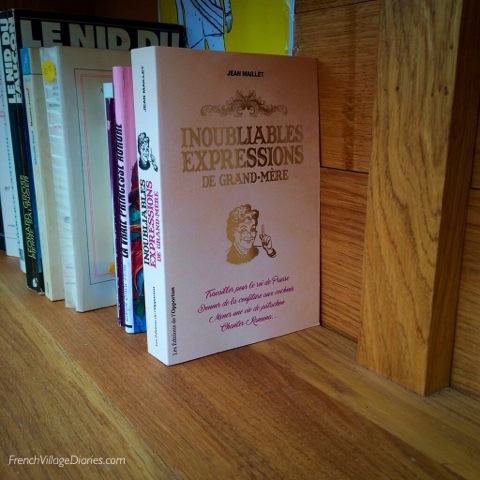 Inoubliables Expressions de Grand-Mère by Jean Maillet (Grandma’s Unforgettable Expressions) piqued my interest enough to take a look, and one look was enough to know that despite it being over 400 pages, I had to take this book. With 365 sayings explained with a shortish paragraph, it will be perfect for me to dip in and out of, although reading in French, it may well take me a year to finish it. But as she grew up in Ireland I’m guessing it was colder there in May than it is here. There was something else about this book that caught my eye; it looks and feels brand new. This is not surprising as this edition was only published in October 2016, so I guess it has either not been read (unwanted gift maybe) or just had one very careful owner. I did wonder if the author was a local, and had left a new copy, so once home, good old google was summoned. Jean Maillet was born in Saintes in the Charente-Maritime and studied in Angouleme, Poitiers and Bressuire, so although not a local to Melle, he is certainly local to this area. I also discovered he is an English teacher and author of several other language-themed books including 100 anglicisms à ne plus jamais utiliser (100 Anglicism’s never to be used again! 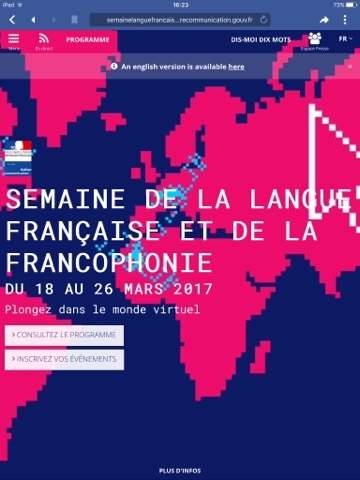 Yesterday was also the start of the Semaine de la Langue Française et de la Francophonie, a week where we have been invited to have fun and celebrate the French Language. And why not, it is a beautiful thing to listen to, and even if I’ll probably never have perfect grammar or pronunciation, I do enjoy speaking in French. What a day to find this book by this author, someone who is passionate about the French language and whose books have a fun feel to them – even if he does seem a little upset with us Anglophones and our words that creep into his belle language. At least he will be helping me with my French reading, and teaching me an expression or two along the way, including 'donner de la confiture aux cochons' - giving jam to pigs! 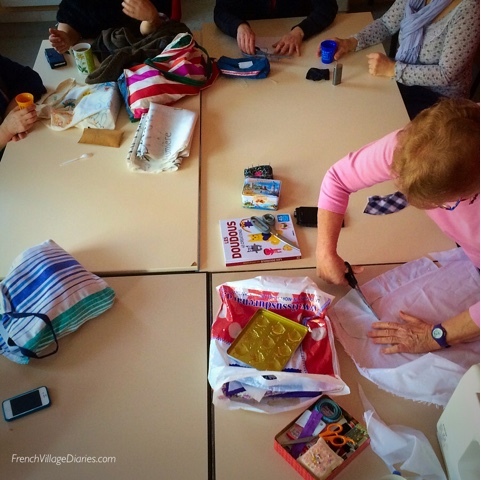 This post has been linked to Dreaming of France at Paulita's blog. 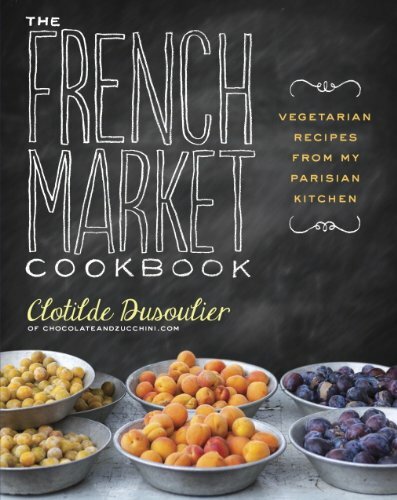 My review today is for The French Market Cookbook by Clotilde Dusoulier, who is also author of the great blog Chocolate and Zucchini. Clotilde includes recipes from all over France and she thoughtfully gives a personal introduction to each dish, sharing why she likes it and where it comes from. She also adds in snippets of her Parisian life, which I enjoyed reading about. Split into seasons, Clotilde begins each section with a list of the produce we should be concentrating on at different times of year, before selecting seasonal dishes to make the best of them. I could almost taste many of her dishes, just from reading her description of the flavours, and the photos made my mouth water. 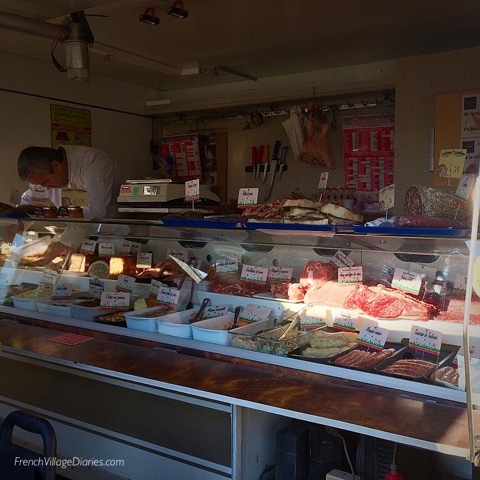 There was so much choice and flavour; I didn’t miss the meat at all. Clotilde includes her measurements in cups and grams, for which I thank her. Coming from the UK, I grew up using Mums scales in lbs and oz and now happily use grams, but cups I’m afraid remain a mystery to me. After a good few hours browsing I had a list of fourteen Must Try recipes and all of them looked simple and very tasty. The only problem I found was which one to try first. In the end it was the Savoury Pumpkin and Cornmeal Quick Bread. It was an easy to follow recipe that worked first time, even though I was new to baking cornbread, and it was delicious. I can also recommend the Cauliflower Gratin with Turmeric and Hazelnuts. Made with the fresh cauliflower I purchased at our village market, it was delicious and comforting. I know I will get a lot of use from this book as so many of the ingredients are ones we grow, or are lucky enough to be able to buy from small local producers. Every time I pick it up it whets my appetite. The combination of easy to follow recipes and great flavours makes me a happy cook. This book would be perfect if you are looking for fresh, tasty ideas as you make the move away from eating too much meat and trying to cook with the seasons. 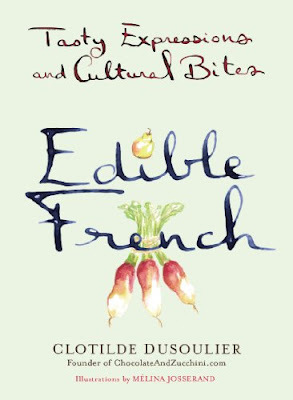 In addition to my review of The French Market Cookbook, I just had to tell you about Edible French, also by Clotilde Dusolier, that I recently treated myself to on kindle. This beautifully illustrated little book explains some of the edible idioms of the French language. 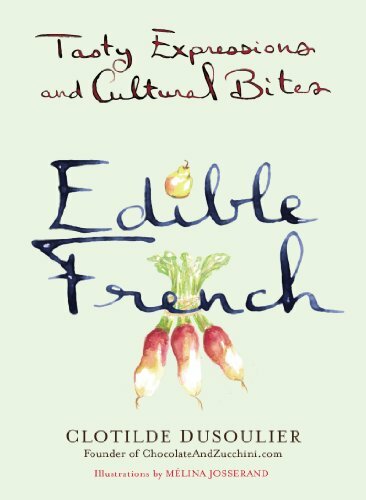 In France there are lots of expressions that include the use of food and in this short book (published following a series of blog posts Clotilde wrote on Chocolate and Zucchini) she introduces us to fifty of them. In addition, each one is beautifully illustrated, (even in the kindle version) by watercolour artist Mélina Josserand. Clotilde translates them, explains their meanings and teaches us their origins. Some translate to a similar saying in English; some are very French and for some Clotilde includes recipes too. I really enjoyed learning some new sayings and having fun with the French language through this book. 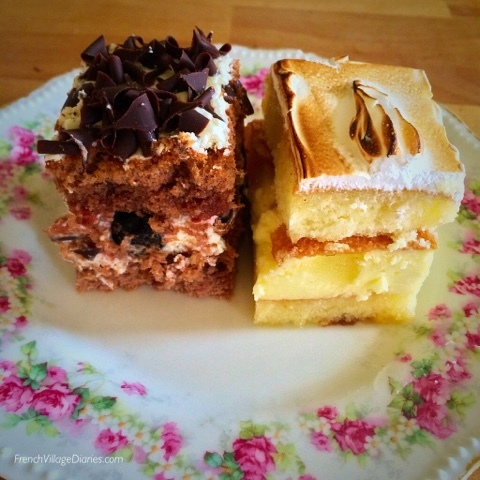 You can read Clotilde’s blog Chocolate and Zucchini here and follow her on Twitter, Facebook, Pinterest and Instagram. My review today is for the new release from Julie Stock, The Vineyard in Alsace. Didier and Fran have history; they loved, then lost each other when their lives moved on after university, hers to London where she wanted him to join her, his to his family’s vineyard in Alsace. Following the break up of her relationship in London, Fran returns to France and finds a job working at the Domaine des Montagnes, Didier’s vineyard. Didier obviously didn’t open up to her when they were dating, as she was pretty clueless about his family and their wine business, but with nowhere else to go she agrees to stay. Thankfully Didier has changed. He is honest, caring, passionate and although more reliable than exciting, I liked him. Fran is sensitive, has had a lucky escape from a controlling relationship, but is uncertain about what she wants from her future. Decisions need to be made and for Fran that could be difficult, especially with a couple of nasty ex’s who seem intent on causing trouble. Didier and Fran take turns narrating their story, which means we get to know what they are thinking and feeling, as well as what they are saying to each other, however there were times I found myself having to backtrack as I’d become confused as to who was narrating. This is a light and easy, feel good read, that takes you to the heart of an Alsace vineyard at harvest time, although I think Domaine d’Amour would have been a better name for the vineyard. There seemed to be something in the water (or wine maybe) that once through the archway and into the courtyard, a little bit of love-magic seemed to be at work for everyone. This is the first of a series of books set at the vineyard and I’m looking forward to reading more. The Vineyard in Alsace is available in ebook and paperback format, links to Amazon below. You can follow Julie on her website here, and on Facebook, Twitter and Goodreads and you can read my recent France et Moi interview with her here. Like the bugs and the bees who are beginning to reappear after a winter tucked away, I have spent my Saturday out in the garden. As always on a weekend there is lots of laundry to do, once Ed has unpacked his school suitcase, and the sunny, warm weather today meant I was able to dry all three wash loads outside, which always puts a smile on my face. Tomorrow we have rain forecast, so perfect weather for tackling the ironing and keeping up to speed with the domestic chores. 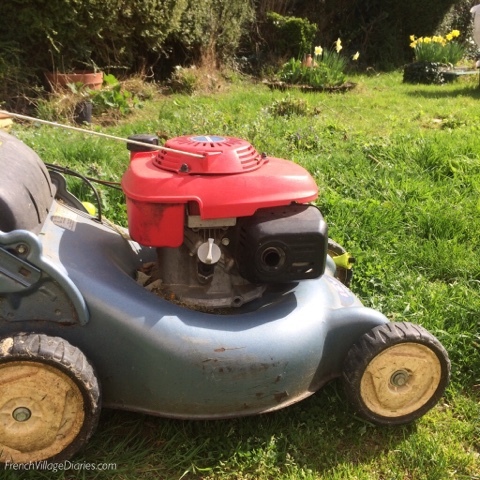 Today also marked my first lawn mow of the year and as always it was a gentle, high cut as the grass really won't thank you for a severe haircut this early in the season. 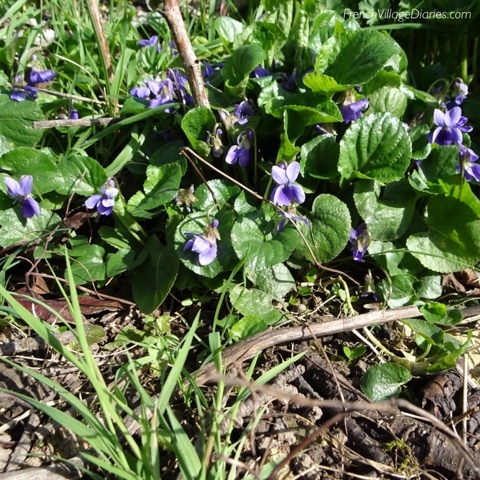 A high cut has many other benefits including skimming over the flowering weeds that look good, smell lovely (in the case of the violas) and are providing food for the bees, as well as being a quick job as there is not too much emptying of the grass box to do. There was so much to see in the garden today I couldn't help taking a few pictures. Once all my work was done I took a moment to sit in the sun, listening to the birdsong and the gentle buzzing of the bees in the blossom while I read my book. 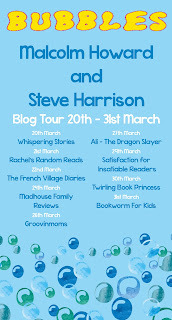 I can't wait to write my review for A Chateau for Sale by Carrie Parker as it really is quite different and very cleverly written. 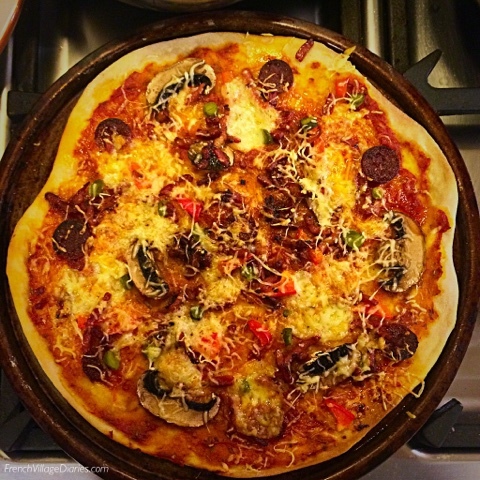 My day was perfectly finished off with a homemade pizza and a glass of white wine, delicious. 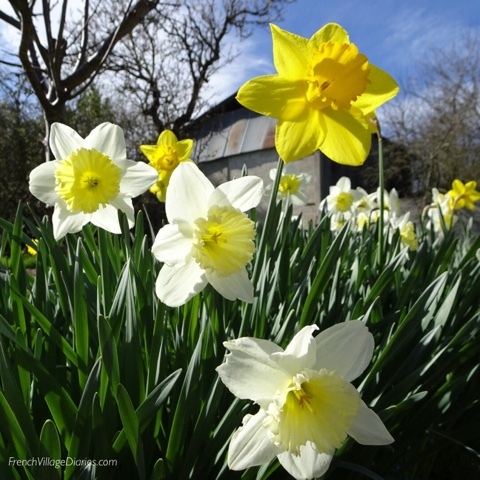 I hope you have enjoyed these snapshots from a sunny Saturday in my French village garden. Welcome to ‘France et Moi’ where this week, to coincide with the release of her latest novel, The Vineyard in Alsace, I am talking to author Julie Stock about what France means to her. Julie Stock is an author of contemporary romance novels, novellas and short stories. She’s a proud member of the Romantic Novelists’ Association. She blogs regularly on her website ‘My Writing Life’. Julie: I think one of the things that makes France so unique for me is particular smells that just seem so French. I wrote this into my book actually, giving the example of when you first arrive in France and smell the unmistakably French smell of a boulangerie. There’s nothing more French than that really for me. 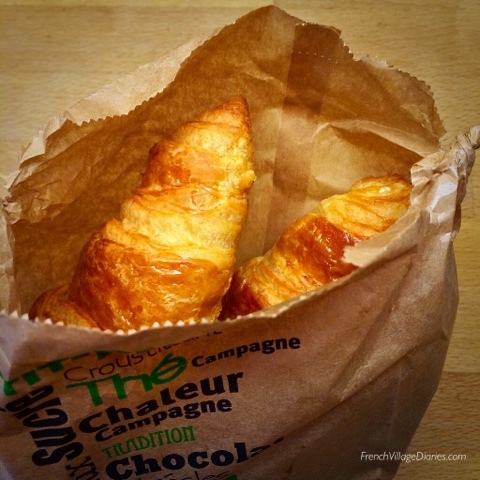 The smell of croissants and pains au chocolats baking in the morning is the smell of France to me. 2) What is your earliest memory of time spent in France? 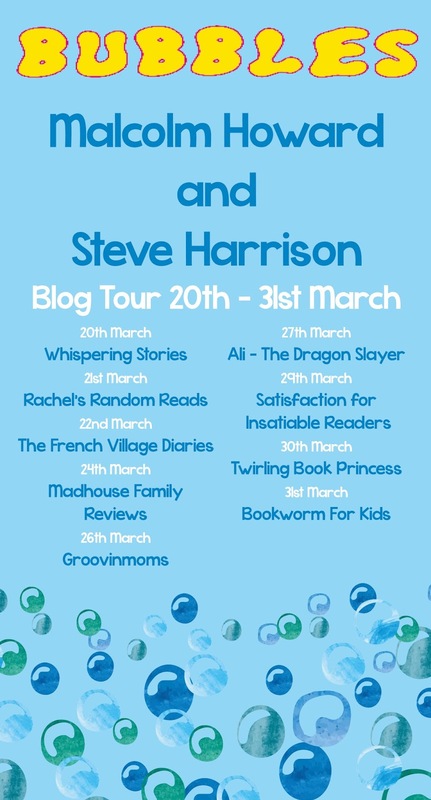 Julie: I first went to France on holiday when I was a young teenager to visit my family who are based around a village called Langon, near Bordeaux. My maternal grand-dad’s mum moved with him to France from Czechoslovakia just before the start of the second World War. She remarried and settled there with her new husband. I had never met the family before and suddenly I had a whole host of new aunts, uncles and cousins. It was fabulous and I became very close to them all. 3) Your latest novel is set in Alsace, is this a region of France you know well? 4) Would you say time spent in France has inspired your writing? Julie: Definitely. I find France a very romantic country in many ways and fell in love with Paris the very first time I went there as a teenager. 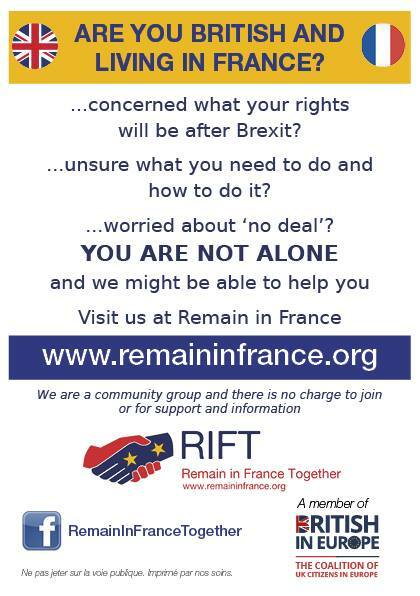 My husband and I lived in France when I was doing my degree and I think that was where we properly got to know each other. Then we went back to Paris when we got engaged, as well as spending our honeymoon there. I love the language and the culture, and I always knew, after I started writing, that I would one day set a book there. Setting is so important to me and my love of France and my wine knowledge made Alsace an easy choice for this book. 5) If money and commitments were no object where in France would you like to own a property and what sort of place would it be? Julie: Well, I do love Alsace, of course, for the picture postcard beauty of its towns and villages. And I love the wines too (did I mention that?) 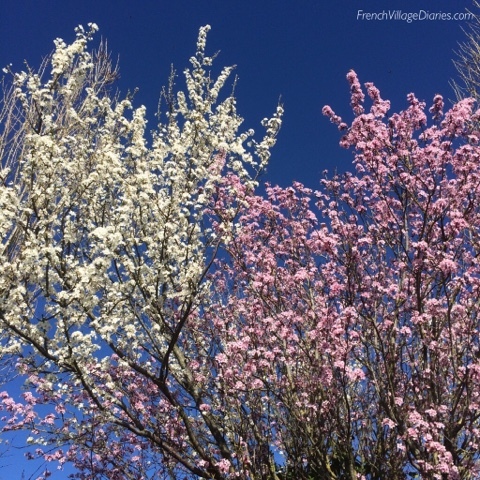 However, most of our holidays have been spent in the Vendée, Poitou-Charentes and Aquitaine regions so I would probably choose to live in one of those départements. I love the typical French farmhouses with pale blue shutters, a little bit of land around and definitely a pool. I’d like to be by the sea and not too far from a bustling town. Julie: At that time of day, I’d probably order un café crème and maybe a small pastry, a croissant or a pain au chocolat. 7) France has many different cheeses, a silly question, but which French cheese are you? A hard and mature Tome, a soft, fresh and lively goat cheese, the creamy and rich Camembert or maybe the salty and serious Roquefort? Julie: I would see myself as a creamy and rich Camembert, or a luscious Brie! 8) What is your favourite thing to buy in a Boulangerie/Patisserie? Julie: I love anything made from choux pastry, especially the éclairs you only seem to find in France with the coffee-flavoured icing and filling. I also love those little strawberry tarts! 9) Writing about a vineyard, must mean you’re quite knowledgeable about French wine, so what is your favourite French tipple, and yes I know there are many to choose from? Julie: This is probably the hardest question for me! I love French wine from all regions. I am especially partial to reds from St. Emilion and the Rhône but one of my favourite reds is Corbières from the Languedoc. As for white wines, my favourite is probably Alsace Gewurztraminer. I’m always very happy to drink a glass of champagne too! 10) Can you describe your perfect French apéro for us, including the drinks, the nibbles, the location and the company? Julie: Again, so many to choose from. We like to drink the apéritif of the region we’re in so we’ve tried a few different ones over the years. One of my favourites though, which I haven’t had for a very long time, is Pineau des Charentes. There’s nothing nicer than sitting outside in the early evening sunshine drinking a cold glass of Pineau. I could quite fancy one as I write this. On our tour of France, we visited Châtelaillon Plage and I remember sitting outside at a café drinking Pineau and eating olives and some nuts as the evening sun began to fade. Heaven. Finally, can you tell us a bit about your new novel The Vineyard in Alsace? 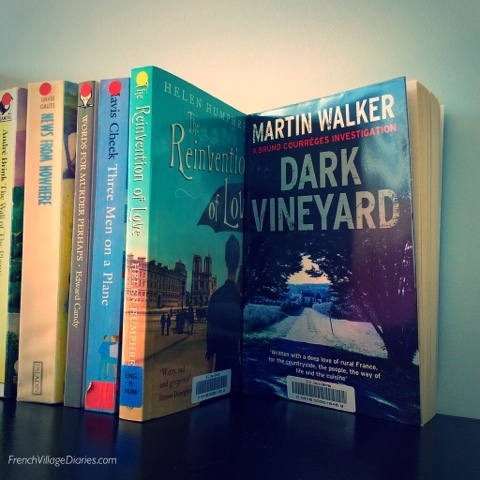 Can we expect more novels set in France in the future? You can read my review of The Vineyard in Alsace here. You can connect with Juile on Twitter, on Goodreads and via her Facebook Author Page.